UW23 an original photograph by Jen Yu (that’s me) goes to Lee Knapp! UW24 a $100 gift certificate to the Culinary School of the Rockies goes to Laura Vanderschaaf! 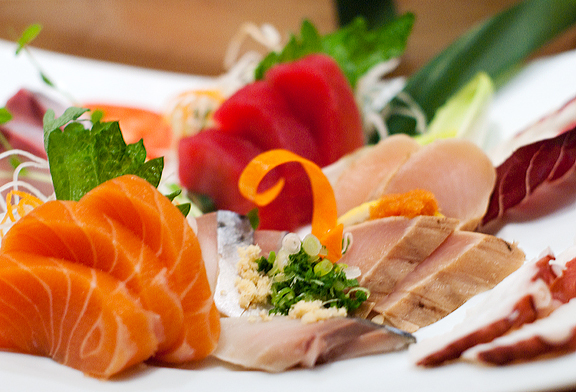 UW25 a $100 gift card to SALT goes to Susan Tamaki! The winners should contact me with their email addresses so I can get you your prizes. Thank you to everyone who contributed to this annual fundraising effort which raised over $78,000 for the UN World Food Program. As always, a huge thanks to the regional hosts and a huge thanks to Pim for everything. We haven’t had much snow this winter, which is not atypical for an El Niño year in the Rockies. 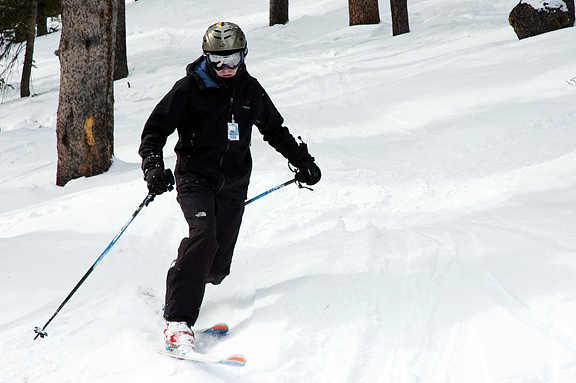 Many of my ski pals are getting antsy in the pantsy for some fluffy, white powder because we’re at the end of January. While I might bemoan the paltry number of epic ski days this year (um, NONE so far), it really hasn’t cramped my style. I always shake my head at people who complain that they are bored. I don’t even know how to achieve that. I cram as much as I can into every day because every day is a gift… aaaaand because I’m hyper. Oddly, when Work gets busy, Play seems to get just as busy. I like busy. 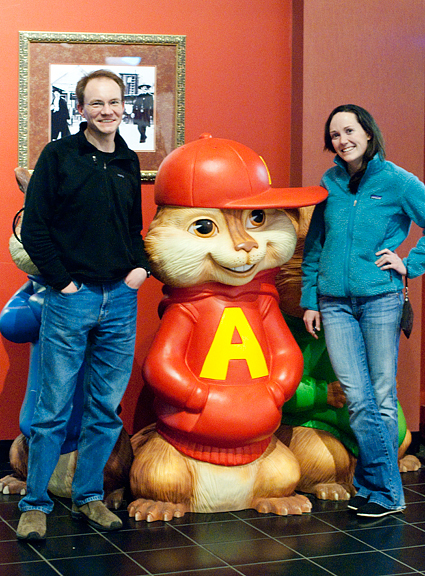 We’ve been having plenty of fun. And don’t forget the mi fun. What is mi fun? 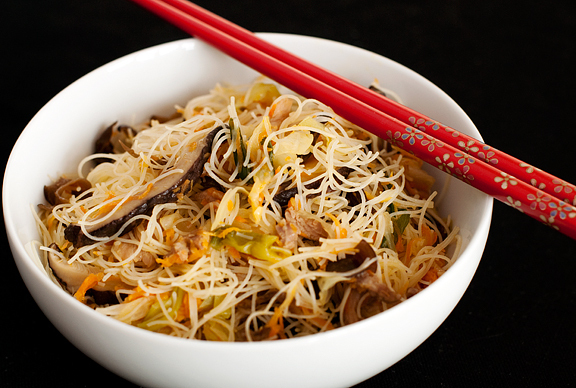 It’s Chinese for rice noodle vermicelli. 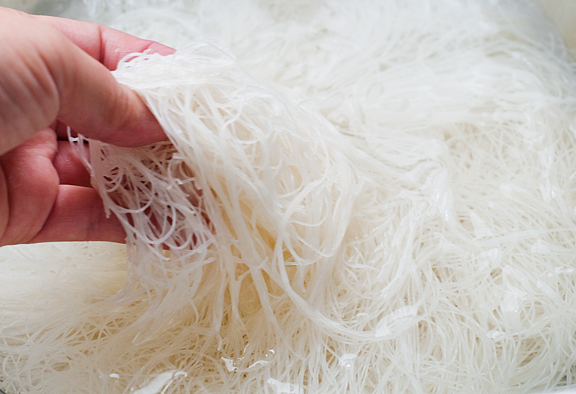 Or would that be rice vermicelli? It is yet another Asian noodle I grew up eating and loving. I’ve never found them fresh, only dried in the Asian grocery stores. I usually have at least a package or two of the dried, delicate noodles in my pantry. The day before Jeremy and I got married (in my advisor’s living room), all of our wedding guests were hanging out in our tiny apartment. We were a dozen people in total. Our wedding was not a big to do. It wasn’t even a little to do. We didn’t want a wedding, we just wanted our moms to quit asking when we were getting married :) Like any Good Chinese Mother, my mom insisted on feeding everyone and in no time flat, she whipped up a huge batch of stir-fried mi fun! Since Jeremy’s brother doesn’t eat pork, my mom made a special vegetarian batch just for him. Now that I think of it, it had chicken broth in it, so it wasn’t truly vegetarian. The Chinese are not so good about the whole “Does it have meat?” issue, because at the dim sum restaurants they always smile, “No, no meat! It’s chicken!” Anyway, you can probably use your favorite vegetable broth and omit the pork (or use tofu?) for a vegetarian version. 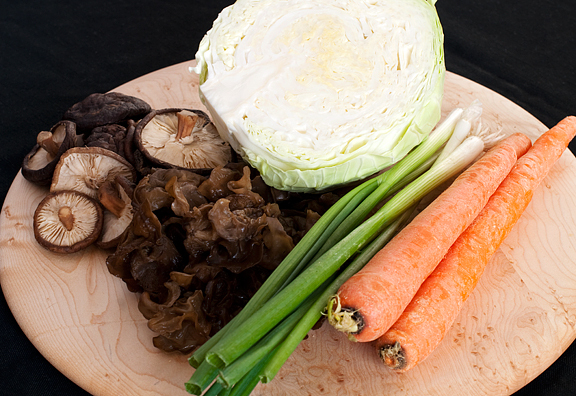 I prefer to use regular cabbage to Napa cabbage because it has a crunchier texture when cooked and retains a nice green color. If you fine shred the carrot, it will turn your noodles slightly orangish. You can reduce that orange effect by using a coarse shred instead. I shot this recipe according to the instructions my mom gave me, but I prefer a higher ratio of goodies (i.e. 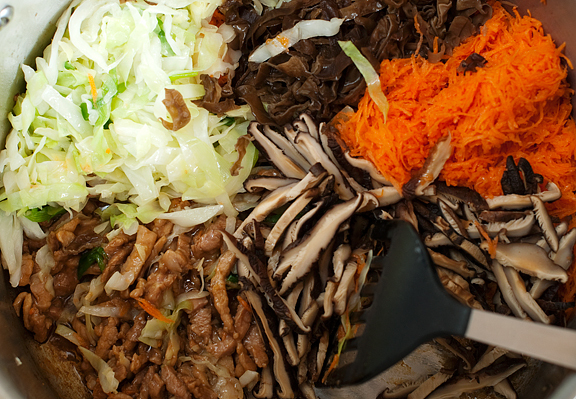 vegetables and meat) to the rice noodles. If you do too, I suggest increasing the amount of vegetables as you desire. As with most of the Chinese recipes I make, the prep takes most of the time and the cooking takes mere minutes. I do recommend cutting the noodles before cooking because I’ve tried it without cutting them and it is considerably harder to stir-fry well. The Chinese generally don’t like to break noodles (especially birthday noodles) because unbroken noodles represent long life. I don’t know why it’s okay in this case, but perhaps the added stress of stir-frying a mass of long rice noodles outweighs the bad luck? There are many ways you can prepare this dish and they make excellent leftovers. Jen’s Note: I like my mi fun to have more vegetables and meat so I just add a little more of each when I make this. [If the mushrooms and tree ears are dehydrated, rehydrate them in boiling hot water, then rinse and squeeze out.] Soak the mi fun in lukewarm water for 15 minutes or until pliable. 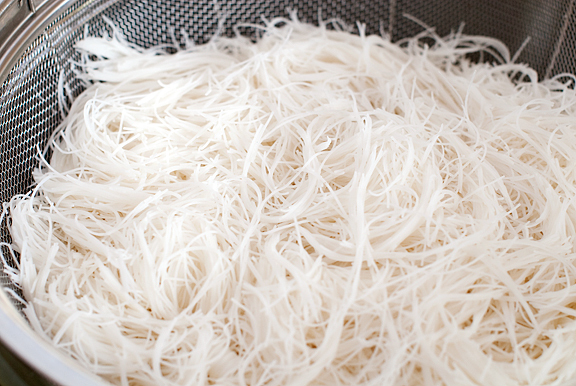 Drain the noodles and cut them into short strips with clean kitchen scissors. 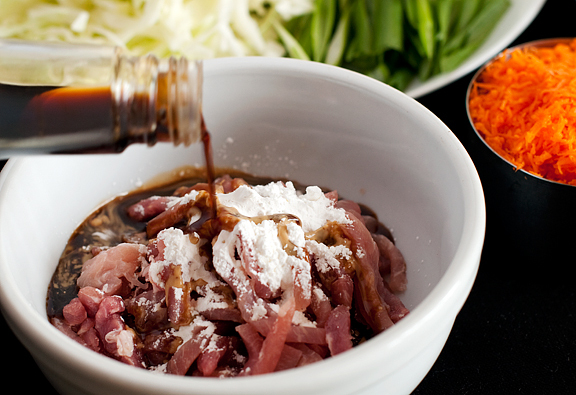 Mix the pork, soy sauce, sesame oil, and cornstarch in a bowl and set aside. Pour 2 tablespoons of vegetable oil in a large sauté pan and heat on high. 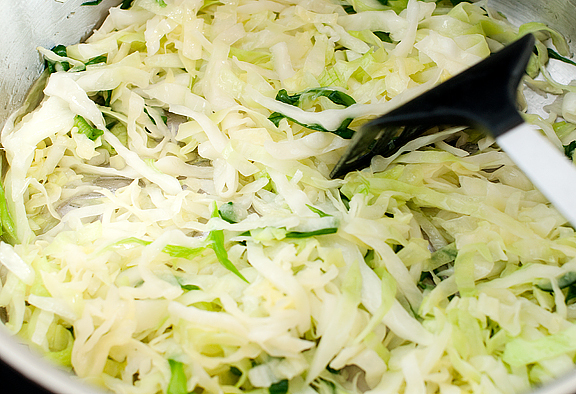 When the oil is hot, quickly add the cabbage and green onions and stir-fry until the cabbage is wilted. Empty the cabbage into a clean bowl. Using the same pan, heat a tablespoon of vegetable oil on medium-high heat. When the oil is hot, add the pork and stir-fry until the meat is cooked. Add the cabbage mixture and the rest of the vegetables to the pan and stir together. Pour in 1 cup of chicken broth and stir again. When the liquid comes to a boil, reduce the heat to simmer and let the liquid boil off. 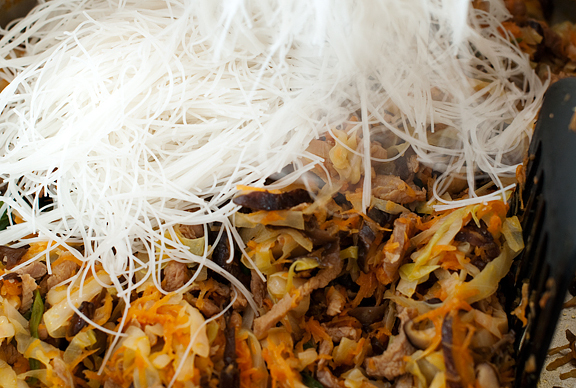 Add the rice noodles and stir-fry for a few minutes. Serve hot. I love my mother’s mi fun…definitely the dish she turns to when she needs to whip up a huge batch of food quickly! I am always so, so happy when I see your Chinese recipes because they always seem to be the exact dishes that we order when we go out…but now I can cook them at home which is even better. The first time I had rice vermicelli I pretty much wondered where they’d been all my life. Bonus points because my three year old devours this dish. I cannot wait to make this, thank you. In Malaysia, we call it “bee hoon” but it’s basically the same thing. We just made some Tom Yam Fried Beehoon the other day. Wonderful. I intend to try mi fun this weekend, [hopefully] as a celebration after I pass my oral defense! Eeek. 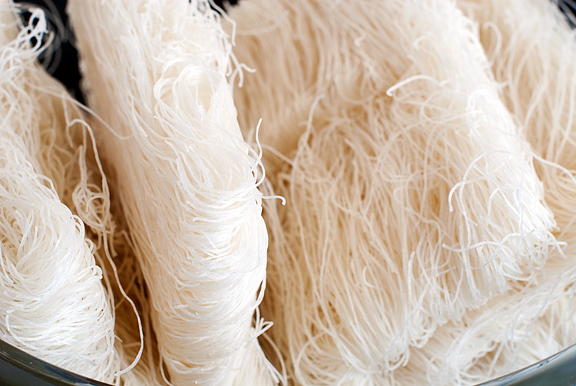 Ooh, I learn something new every day: it reminded me of Pancit Bihon from the Philippines, and of course Nate pointed out that they call it bee hoon in Malaysia. Ha! It’s my mum’s favorite kind. I can’t call it my favorite — cos I like ALL the Asian noodles, of course! Mmm this sounds delicious and came at the perfect time since I have most of the ingredients on hand. Thanks for the step by step photos! Lovely dish! I’m going to have to track down these noodles. OK, I’m in! Jen, you put the fun in mi fun! Now I know what to do with the cabbage in the crisper. OK, my stomach is growling from your photos, and it’s not even lunch time yet! I went to Asian Seafood Market the other day to grab some Argentinean goodies, did a write up on it today and linked to your post about them. Cheers! Oops .. sorry for the unfinished post!! This fried mi fun is something that was sold in small eating stall in Indonesia. The only difference with this version is that we add sweet soy sauce. I didn’t know they were called “mi fun”… but this recipe sounds delicious! How I wish the cafeteria here could look at your blog for inspiration…. Tried this tonight… absolutely yummy! Had to make a few changes… chinese mushrooms not a commodity that is available in rural North Tipperary, Ireland! Still nice tho! Making this tonight, minus the tree ears. . . Can’t wait to put it in my mouth! the fact that I just read this, and then looked in my fridge and the only ingredient I have from the list is soy sauce… well lets just say its really depressing me. looks amazing and healthy and I want a big bowl asap! Ohhhh I always have problems loosening up the mi fen. I’ll try cutting them up before frying! Thanks for your recipe!! My mom likes to make this, too. Yours looks wonderful! Delicious and our fav quick fix meal. 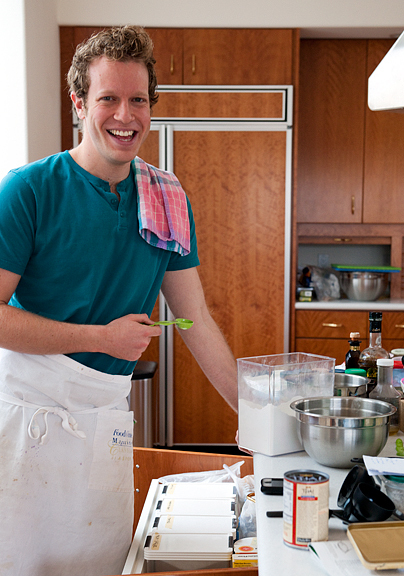 I use pretty much similar ingredients as yours except with more veggies. Thanks to you I’ve been building up quite a stash of Asian goodies, now I know what to do with those noodles…..And I had just commented today on the lack of a major snow storm. Here in the northeast we’re also a bit lacking, kids only had ONE snow day so far. Hmmmm, i’m ready for one of those major dumps, bring it on! Wow mi-fun, so this is what we have been eating this week… does it have the same name if you change the protein? we have been eating with prawns or tofu instead. Kristina – yup! He grew up in Boulder :) Really awesome fellow. Michelle – yeah, some of these dishes you can’t even find at a westernized Chinese resto :( I like being able to make it myself b/c it’s cheaper, better, and I can make it whenever I want. 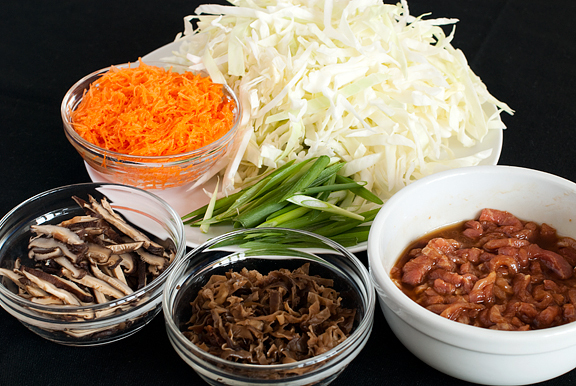 Amanda – tree ears are a fungus (like mushrooms) that you can buy fresh in good Asian markets or find dried at most Asian grocers. I love them. Tartelette – we’re not going to have enough days for the foods I want to feed you when you come out to Colorado! ;) You and B better pack up and just move out here! Kate – I think mi fun is so versatile you can toss anything you like in it – so shrimp should be great!